The kadai chicken is one of the famous non-veg curry recipe in the north indian restaurant cuisine. It is famous for their unbeatable red spicy aroma. The marinated chicken is cooked in a ‘kadai’(an indian wok) with onions,tomatoes and capsicum flavoured up with the punch of garam masala. Fresh cream has given the creamy flavour which will enhance the kadai flavour to more. 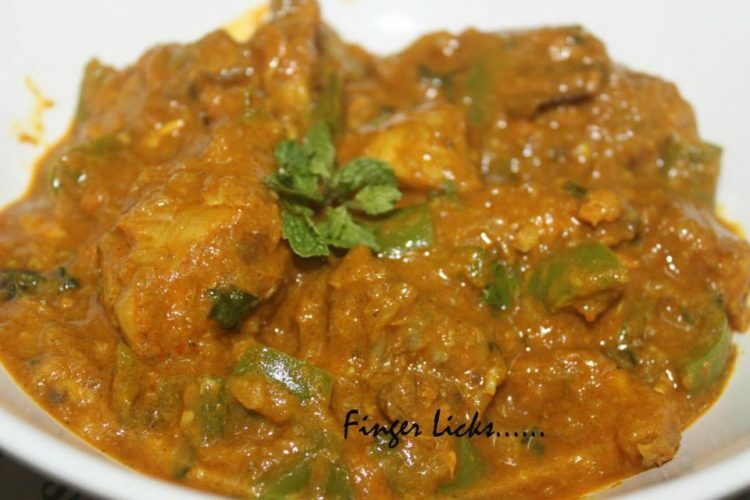 Other than chicken a variety of vegetables or even mushrooms, chicken, mutton and paneer can be cooked in this gravy. It tastes amazing with Indian breads like naan, roti, paratha, chapatti or even with rice. Marinate chicken with turmeric powder, chilly powder, ginger garlic paste, lemon juice and salt. Marinate for 30 minutes. Heat oil in a thick bottomed kadai, Add whole garam masala spices. Saute it . Add finely chopped onion. Fry till onion turns light brown. Add ginger garlic paste and saute till raw smell disappears. Add coriander powder and cumin powder. Saute further for 2 minutes. Add tomato puree, Mix well and cook closed for 2 minutes. Once the oil separates out, add red chilly powder, cook till the masala thickens. Add marinated chicken pieces along with the marinade, Mix in medium flame, so that all the pieces are coated well in the gravy. Add 1 ½ cup water, cover and cook for 10 mins. Stir in between. Cook for another 5 to 7 mins. When the chicken is 75% done, add chopped capsicum, garam masala and salt. mix everything well and cook until the chicken is completely cooked. Add fresh cream/ milk and mix well. Turn off flame and sprinkle freshly chopped coriander leaves. Yummy Kadai Chicken is ready.